Every child who comes to Haven Acres participates free of charge. Many of the children who come would never be able to afford a regular horse program of any kind. The children and teenagers that we serve are struggling with depression, trauma, loss, disabilities… and God uses us to be their safe haven in the midst of these struggles. As a donor, you are the reason that a child gets to come out to Haven Acres! As a donor, you are the reason we are able to provide a loving home for our horses who have extra medical costs. We rely heavily on the generosity of donors who give gifts of varying sizes to support this ministry. Please consider a one-time or ongoing gift of whatever you are able to contribute. Generosity means different dollar amounts for different people! Haven Acres is a nonprofit organization classified as a 501 (c)(3) by the Internal Revenue Service. Our federal tax identification number is: 46-1649331. We send out donation receipts for all financial and in-kind donations on an annual basis. In keeping with biblical principles, the Founders and Board of Directors of Haven Acres prayerfully strive to be wise stewards of all financial and in-kind support. Every decision is handled with care and prayerful consideration. Nearly everyone who comes to Haven Acres knows what it’s like to feel broken in some way. That is why it is so special to us to have horses who have experienced the same feeling. Nearly all of our horses are “broken” in some way. One of our horses has anxiety. Some of our horses need ongoing medical care. Our pony is blind in one eye, and many of the horses are too old to be considered useful to most people. 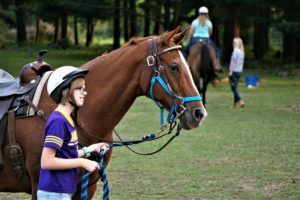 God has been using this model of pairing broken people with broken horses here at Haven Acres to provide healing for both the people and the horses they love. When horses are rescued, donated, or bought by Haven Acres they are provided with more love and attention than most horses get in their whole lives. They are given safety, purpose, and a home with a sense of belonging at Haven Acres. Horse sponsorship is one of our most important means of supporting these special animals at Haven Acres. A full monthly horse sponsorship costs $150 a month. This covers the horse’s feed and medical costs as well as offering them a secure, peaceful, caring family. Partial sponsorships are also available. Contact us to let us know if this is something you would be interested in, or donate through PayPal and write who you are sponsoring in the “notes” section of the donation. Thank you for supporting one of our wonderful horses in this way! This is a list of items that would help the ministry. You can choose to donate one of these items or donate money expressly designated to cover the cost of one of these wishlist items. Most of the horses at Haven Acres have been donated by their previous owners. While the horses were loved at their previous home, life circumstances or equine medical problems can lead people to look for a new, loving home for their special equine. If you are in a situation where you have a horse that you think might fit well with our ministry, please reach out to us. 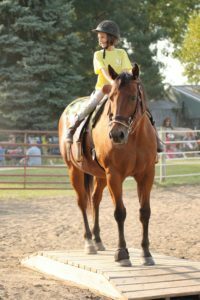 Each of our horses receives intentional, consistent, and loving care by the staff, volunteers, and children. We have a great working relationship with our vet and farrier who have both done wonders with our horses who have had medical needs. On-site staff consistently check over each of the horses year-round and they receive immediate care for any injuries or illnesses sustained. Grain, medicine, and other special supplies are readily used on the horses in our care when necessary. We do have a limited number of spots available for horses at the ranch, but we will let you know if we can take your horse or when a spot becomes available. Horses must be screened by Haven Acres staff and will be prayerfully considered. We cannot guarantee that we will take every horse, but we will do our best to find a good fit.